Did you know that the semiconductor etf can tell us the future of the US stock market and world stock markets? In this article, I will be moving into intermarket analysis using the semiconductor index. If you really want to know whether the bull market in stocks will continue, you need to look at the semiconductor sector. For those of you who read my Daily Stock Market Analysis every day, you will realize that I put in the semiconductor etf quite often. There is a reason for that. 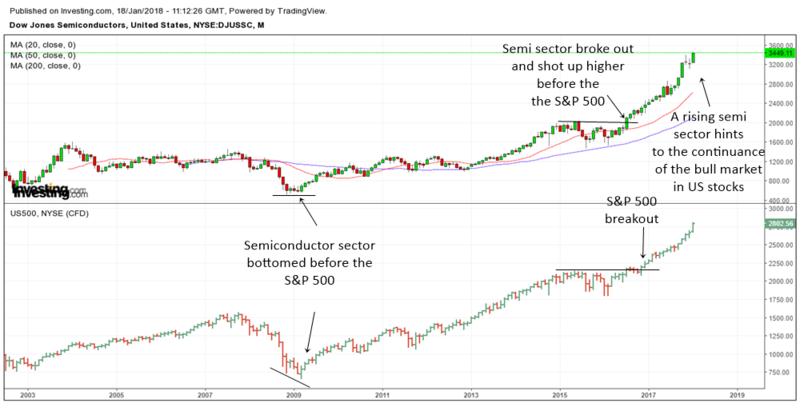 Let me show you some charts of the semiconductor sector along with the S&P 500 index. The image above shows the monthly chart of the Dow Jones Semiconductors Index on top of the monthly chart of the S&P 500 Index. First of all, you will notice that the semiconductor index bottomed out a few months before the S&P 500 index bottomed. This is what we call a bullish divergence. So, when the semiconductors showed strength ahead of the S&P 500 index, this hinted of a recovery in the stock market. The next thing I want to bring to your attention is the big bull run that started in November 2017 after the Presidential Election. If you look carefully, the semiconductor index broke out higher a few months prior to the big bull run in the US stock market. The Semiconductor Index often leads the general market at important turning points. Which is why, if the semiconductor index continues to go up, we can be rest assured that the general markets will also continue to go up. On the other hand, if the semiconductor index starts to top out and starts a new downtrend, this is often a warning sign that the market may be in trouble. To analyze the semiconductor index, I often use the SMH. This is the VanEck Vectors Semiconductors ETF. You can actually trade the ETF like a stock and many traders have taken advantage of this to buy and sell the entire semiconductor sector. The chart above is the daily chart of SMH on top of the daily chart of the S&P 500 index. A rising semiconductor index that is in an uptrend will help to propel the stock market higher. 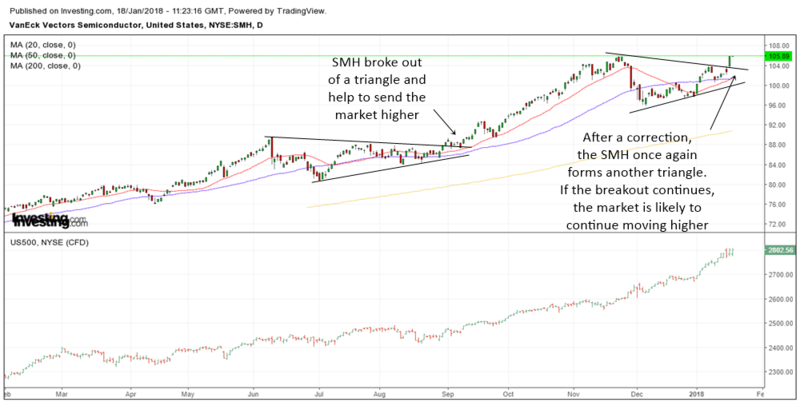 Back in 2017, the SMH formed a triangle pattern which it broke out of in September 2017. From there on, we had a super bull run in semi stocks. Not only that, the entire stock market also shot up higher. As with all nice run ups, there will be a correction someway along the way. The SMH started to correct in late November 2017 to December 2017. After the correction, the SMH stabilized and formed a triangle pattern again. At this moment, the SMH is breaking out of the triangle pattern. If history has any bearing on this, we may see another nice bull run in semi stocks and the stock market as long as the SMH continues to go higher. Not only is the semiconductor etf good to gauge the health of the US stock market, it can also be used to analyze the health of world stock markets. Since the whole world is very much using semiconductors, the rise and fall of the semiconductor index can often give us early hints about the world economy. If you think about it, it really makes sense. Everyone has a smart phone or a laptop these days. And there are tons of other stuff that uses semiconductors. So the economic recovery of the whole world or the improving world economy can be known by looking at the semiconductor etf. The image above is the weekly chart of the SMH on top of the weekly chart of ACWI. ACWI captures stocks in 23 developed and 24 emerging markets. So, it is quite a good representation of the world economy. You can read more about the ACWI on their website. Even in the weekly chart, we can see how the SMH can lead world markets. Back in early 2016, the SMH made a higher low while world markets made a lower low. This is what technicians call a bullish divergence. A bullish divergence hints to internal strength. Which is why world markets rose up from that point. Soon, the SMH broke a downtrendline and moved higher. This hinted of an improving world economy. 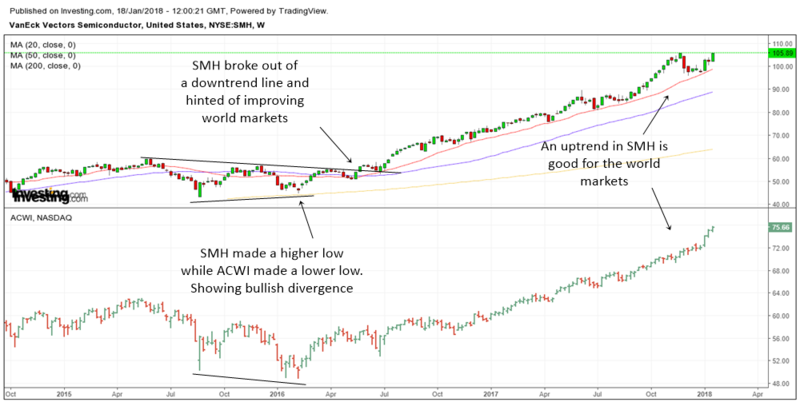 The world markets followed the SMH and they have both been in an uptrend ever since. The SMH has been in a very very long weekly uptrend. As long as the uptrend in the semiconductor etf continues, we can expect more gains in the world stock markets. You have now learned a very special intermarket relationship that not many market participants know about. Once you know how the semiconductor sector can lead the stock market, you will not be easily caught off guard. Do remember that intermarket relationships do not happen overnight. You need to see it from a weekly or monthly point of view. They move slow but they will move. This allows many fund managers or large investors to be able to get in or out in time before the next great move happens in the stock market.